When I first received my copy of artist Ross B. Young’s book, The Way It Should Be, I expected to see a book full of beautiful pictures of his hunting and fishing artwork. Believe me, Ross’s book does not disappoint! “The Way It Should Be” by Ross B. Young. 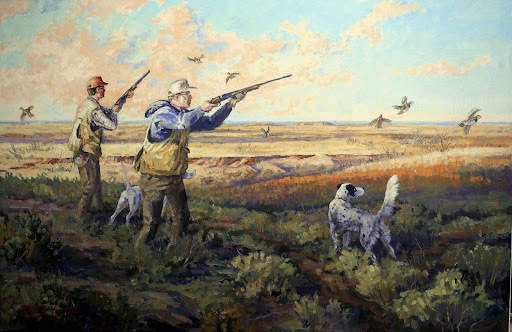 This painting depicts Ross’s last quail hunt with his father who instilled in Ross the love of the outdoors. In the book, Ross tells the story of his father’s smooth swing and the dropping of a nice quail at the shot. What a great tribute! Ross passes on his father’s legacy in every one of his paintings. What I did not expect was the interesting story underlying Ross’s artwork. Here is a man who has lived life on his own terms as the master of his own destiny. And I greatly respect and admire this about Ross. Ross received a Bachelor of Fine Arts in 1977 from Tulsa University and a Master of Art in 1980. After graduating from college, Ross and his wife moved to Kennebuck, Maine where he commenced painting for a living. In his first year of his career, he netted a whopping $439.39. Many would have given up the dream at that point, but not Ross. He perserved through the tough times until he found success. Ross now lives and paints in Springfield Missouri, “The Show Me State,” which I think fits Ross’s determined character. 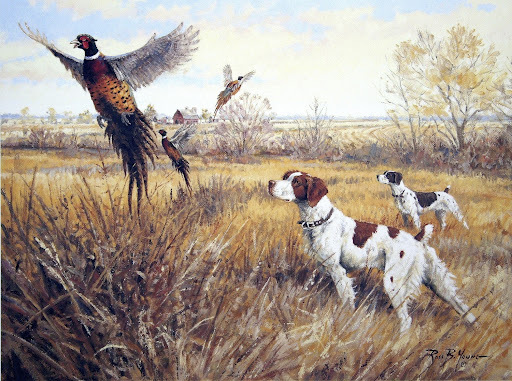 One of the impressive things that I did not know about Ross before reading the book is that he now paints the portraits of the champion dogs for the National Shoot to Retrieve Association, the Purina Brittany Open All Age Award, the National Bird Dog Championship, the Purina Top Dog Award, the Continental Championship, the National Open Shooting Dog Championship, the American Field Quail and Pheasant Futuritys, and the U.S. Invitational Shooting Dog Championship. Humbly shifting the spotlight from himself, Ross wrote that these are “all opportunities to paint the greatest canine athletes in the world.” If that is the case, then think about what this says about Ross and his artwork. Very impressive (even for someone, like myself, who does not field trial or follow field trials)! “The Pros” by Ross B. Young. Although Ross paints all sporting breeds, I sense that he has a special place in his heart for Brittanys. Ross actually painted the cover of the anthology on the Brittany called, A Feisty Little Pointing Dog. While Ross’s champion dog portraits are excellent, the main reason I was drawn to the book was his sporting art. 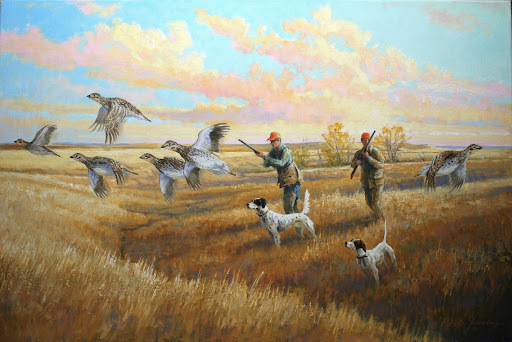 Ross’s paintings cover primarily bird hunting and fly fishing. Regarding his approach to his art, Ross wrote: “Throughout my career I have tried to paint the spirit of the subject rather than every hair and blade of grass. I feel it is my job as an artist to show you my interpretaion, my emotional response to a subject through paint. For me that is the magical aspect of art and what gives it the bond of human interaction between the artist and the viewer.” In reviewing the numerous paintings within this book, I can attest that Ross truly captures the ambience, the feeling, the spirit–or to use his word–the magic, of our experiences outdoors. This is why his artwork resonates with me and many others. “Old Gate Ruffs” by Ross B. Young. 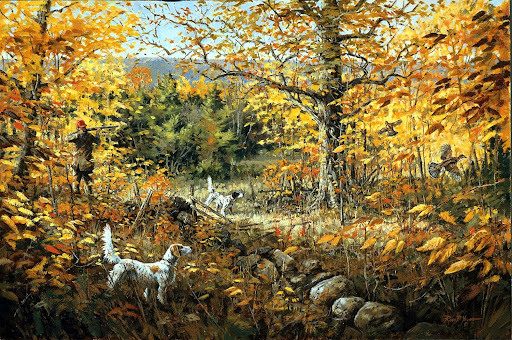 In his book, Ross explains that while he was in Maine, he hunted many beautiful coverts like the one depicted in this painting. Ross was described by one person as the “new Osthaus.” With paintings like this, I don’t think that is a misnomer. “Sharp Shooters” by Ross B. Young. This painting depicts one of mine and Ross’s favorite birds to hunt, the sharptail. “Doubled Up” by Ross B. Young. 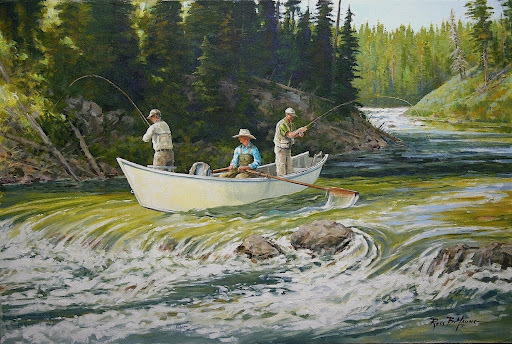 In this painting, Ross captures well one of my home rivers, the Henry’s Fork. To sum it up, Ross’s book is a treasure for the sportsman. No doubt, for years to come, I will be pulling this book down from the shelf during the dead of winter to help me remember days past and to dream of future days afield and on stream. As the title of the book suggests, Ross captures the great outdoors, The Way It Should Be. Special thanks to Ross B. Young for granting me permission to use all of the artwork in this post. You can purchase Ross’s book and his artwork at http://www.rossyoung.com/.